Finally, we have the Mainichi Shimbun (MS) articles of 1/5/14, “TEPCO seeks refunds of evacuation payments from employees, rejects ADR settlement” and 1/8/14, “TEPCO demands families of employees return compensation for evacuation”. (http://mainichi.jp/english/english/newsselect/news/20140104p2a00m0na005000c.html -- http://mainichi.jp/english/english/newsselect/news/20140106p2a00m0na019000c.html) Tepco does not feel they should have to provide property compensation to people who rented their homes at the time of evacuation. The company is not challenging property compensation for former homeowners…just people who were Tepco employees who rented. It seems all evacuated Tepco employees have received the same monthly, $1,000 per person pay-outs for property losses as those who do not work for the company. Out of some 85,000 persons who qualify for government-mandated compensation, there are but fifteen who would be affected. A total of more than $1 million in refunds are being sought by the Company. That’s a lot of money, but perhaps they should not have been given the funds in the first place. In one case, a single household is being asked to return $300,000. The employee asked for, and received $200,000 for an anticipated 5 year hiatus from their rented home. This is the bulk of the money the company wants returned. The remainder is because of new appliances and furnishings they bought after moving to another rental property outside the evacuation zone. A second employee who rented had his monthly $1,000 per month property compensation cut by Tepco a little over a year ago, and now wants the money he was cut to be issued to him. Rumor has it that there are other Tepco employees who also had their property compensation cut, as well. In addition, another Tepco employee had won arbitration which would absolve him of making a refund, but Tepco refused the non-binding proposal. Critics are, of course, screaming bloody murder. One said, "The families of employees aren't responsible for the nuclear disaster. As such, the firm's demands for the return of the compensation are inappropriate," which fails to address that the employee was not a homeowner and has been getting a Tepco paycheck all-along. In addition, the lawyer used by the evacuated families of Tepco employees, Tsuyoshi Kamata, says, "TEPCO's attitude to require families of employees to tolerate hardship is impermissible. The company needs to improve itself." After the suit’s dismissal, internet sites and some American news media gave it some journalistic traction. I had covered the suit in my updates, beginning in 2012. I admit I didn’t give it much credence, based on my personal experience in the Navy on a nuclear-powered submarine. All nuclear-powered warships are literally riddled with sensitive radiation monitoring devices. From reports in Stars and Stripes (2) and Navy Times (3), the Reagan’s monitors detected an increase in radiation above background on March 14, 2011 (date of the unit #3 explosion), while operating about 100 miles off-shore in support of the tsunami recovery effort. When the radiological increase was detected, the ship moved quickly out of the detectibly radioactive plume. Some helicopter crewmembers were mildly contaminated. A total of seventeen personnel were found to have received an exposure equal to a a few months of background radiation. Any military veteran can verify that there is considerable emotional stress with serving our country. Fatigue is part of the process and can be severe. Let’s add to this the popular misconception of there being no safe level of radiation exposure, perpetual mention of a controversy over the biological effects of low level radiation exposure in the world’s Press, and numerous irresponsible websites tying all sorts of diseases to radiation exposure that have never been found to be the case by the medical community, and one can understand why the Reagan sailors filed their unfortunate lawsuit. Radiophobia has significantly increased around the world because of the Fukushima nuclear accident, exacerbated by speculative news stories coming out of Japan posted by their decidedly antinuclear Japanese Press, and the fact that most people have no understanding of the biological effects of ionizing radiation with near-background exposures. It is one of the prime misunderstandings behind the Hiroshima Syndrome (a mortal fear of nuclear energy). As long as the Hiroshima Syndrome continues to infect a significant number of people, the Press will exploit it and literally bend over backwards to keep it alive. As long as pseudo-scientific propagandists are given prime news media time instead of authentic scientific experts concerning low level radiation health effects, unreasonable lawsuits like the Reagan sailor’s will continue to manifest. Radiation is not a bogeyman, but there are powerful popular voices who exploit public ignorance to promote the belief that it is a real-world Freddy Kruger. As Will Rogers so eloquently said, "It ain’t what you don’t know that counts. It’s what you know that ain’t so." As is his modus operendi, Gundersen extended and confabulated the kernel of truth by applying it to all radioactive isotopes from Fukushima. 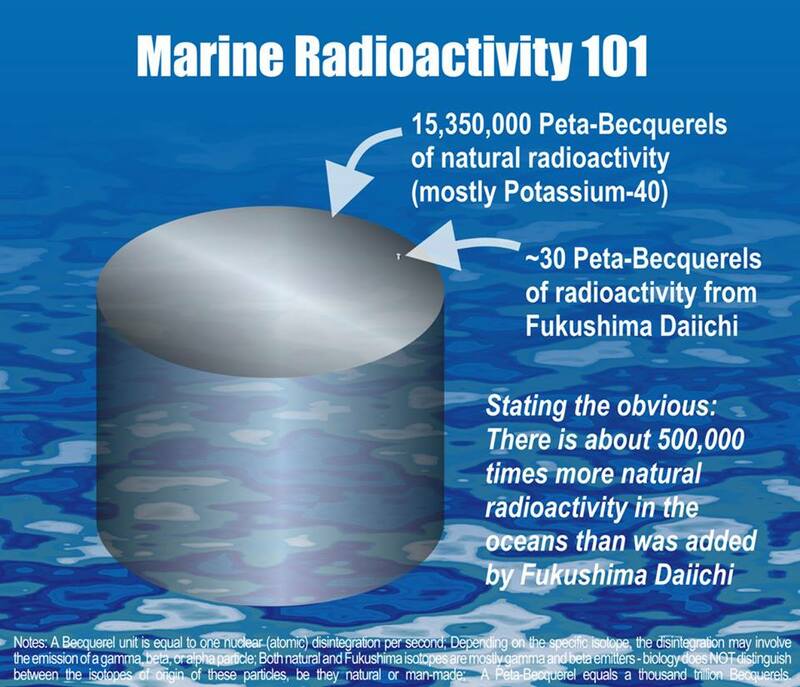 He has also done this with his use of trace Cesium levels from nuclear weapon’s detonations to the total Cesium presumed to be in the F. Daiichi spent fuel pools, then positing there's a massive number of Hiroshima bombs at F. Daiichi waiting to happen. He's a snake oil salesman of fear, and he's eminently successful at exploiting the myths and misconceptions common to the world’s nuclear-averse demographic. Gundersen, and those of his ilk, demonstrate that exploitation of the Hiroshima Syndrome’s prime causality – confusion between reactors and bombs - is effective and profitable! The Hiroshima Syndrome’s Fukushima Commentary is proudly hosting the 188th Carnival of Nuclear Energy Bloggers…Holiday Edition. Before we start, here’s wishing everyone an exciting and wondrous Holiday season. Here’s the Fact or Fiction (?) for this week…The Shippingport Atomic Power Station project broke ground on September 9, 1954, with President Eisenhower turning the first shovel of soil. Now…for this week’s Blogs. For the full articles, please click on the individual links. Blog topics for this edition include – DOE selects NuScale for funding, the carbon-belching energy generation decisions in Japan, a revisiting of President Eisenhower’s “Atoms for Peace”, what Vermont Yankee’s opponents are doing now that the plant will be scrapped, and much more. Why is there no public support to reform nuclear energy regulatory policy? Fact or Fiction (?) answer – Fiction!